Seattle web design firm, efelle creative, launched a new website for one of the top leadership development organizations across the nation, Henley Leadership Group. An incredible modern design showcases Henley's unique offerings, experienced team members and extensive client list. efelle’s FusionCMS website content management system powers their program offerings, responsive architecture, SEO improvements, on-site keyword search, and more. Henley is a team of experts that focus on a transformational, whole leader approach that has been changing cultures across the nation from Microsoft to T-Mobile and plenty more. 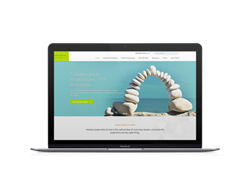 Since Henley is such a unique firm with over 30 years of experience, they were looking for a modern website to truly communicate who they are while providing potential clients and current clients with an intuitive, creative experience, representative of the company’s values and culture. The website also needed to showcase their amazing team and their unique programs. The Henley website was designed to standout as the best within their industry, with a powerful Content Management System (CMS) that gives them the power to manage and easily keep their site updated. The result is an award winning website that showcases Henley's amazing team, unique offerings and high level clients. efelle’s FusionCMS system is the best marketing platform across the industry. Giving clients complete control of their site and truly acting as a way to grow each business to it's fullest. That with an award winning design team puts them a step above the rest. FusionCMS streamlines digital marketing efforts with a built-in newsletter system, blogging platform, automatic PDF updates and client relationship management database. Click here to see Henley Leadership Group's new site. To check out other websites that use the FusionCMS system, visit efelle’s online portfolio. With more than 580 successfully completed custom website design and development projects under its belt, efelle specializes in custom website design and development with an emphasis in organic search engine optimization. Over the past 10 years, efelle has grown into a full, in-house team of web designers and developers, internet marketing professionals, and production and support staff and continues to produce complete online marketing systems for clients nationwide from its Seattle offices. Contact us at 206-384-4909 to learn how we can help you with your law firm or business website design.